The Plotmaster™, by Plotmaster Systems, LLC. with its patented design is the complete package for your tillage and planting needs. The Hunter 800 (8-ft model) was designed for larger tractors (60 hp or larger) and for larger planting applications. It is the perfect planting tool for large food plots, farming, and pasture renovation applications. This larger All-In-One, One-Pass Workhorse will allow you to get the job done in a fraction of the time multiple pieces of equipment takes, which will save you lots of time, money and effort. (Front gang assembly) (12) 18" heavy-duty disks, (Rear gang assembly) (12) 16" heavy-duty disks, both with sealed bearings, notched disc and square axle are used to break up the soil prior to planting. Front disk angle can be adjusted depending on the amount of tillage desired. The rear disk gang is in a fixed position and is especially used to create optimal seed beds by the increased tillage. The rear disk can also be used to place soil on top of seed. Depending on travel speed and top link adjustment the soil disturbance can help the dirt flow on top of the seed. (5) Vibrating steel S-tines come with 3" sweep plow tips to cultivate the soil and to increase down pressure of the front & rear disk for better penetration of soils in heavily vegetated areas and for planting any type of seeds. A unique dual-use cultipacker packs the soil to ensure good seed/soil contact, which greatly improves seed germination. Multi-use, drag levels the soil and covers the seed with the proper amount of soil for optimal production. Flexible metal grating attached to the drag provides a smooth “infield” finish and helps provide even coverage of soil over your seed for improved production. It can also be used to smooth and prepare your seedbed prior to planting in rough, uneven areas. PLOTMASTER’s VERSA Seeding System™ with reverse-auger brush will dispense and plant virtually all types of seed, including NWSG’s and hard-to-plant seed blends, in a single pass. 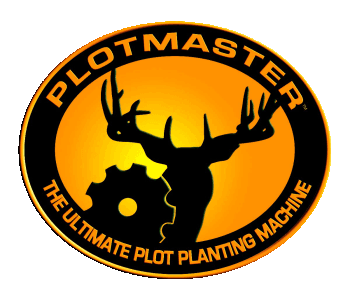 The Plotmaster™ with its revolutionary new one-pass planting process saves an enormous amount of time, money, and effort in planting NWSG’s and food plots for wildlife. Hunter 600 & 800 Models are delivered via LTL, (enclosed truck). Residential deliveries will arrive with lift-gate service but due to the large size of these units they need assistance when being lowered to the ground, (Hay forks, Front end Loaders etc..). Business/Ranch/Farm deliveries with loading docks & forklift access do not require lift-gate service. All sales are final and deposits are non-refundable.